10 Yang, C-H, Chang, Y-Y, Chen, C-W, Chan, M-C, Chu, Y-W (2012). iMADS: The class identification of MADS-box gene on Angiosperm. Advanced Science Letters 18: 170-175. 13 Chen, M-K, Lee, P-F, Yang, C-H* (2011). Delay of flower senescence and abscission in Arabidopsis transformed with an FOREVER YOUNG FLOWER homolog from Oncidium orchid. Plant Signaling & Behavior 6(11): 1841-1843. 1 Kuo-Pen Cheng, Chang-Hsien Yang* (2016). Characterization and functional analysis of FUF1 downstream gene─RAP2.9 in Arabidopsis. The Twenty-fourth Symposium on Recent Advances in Cellular and Molecular Biology. Pingtung, Taiwan. January 27-29, 2016. Abstract No.149. 2 Yu-Ming Huang, Wen-Hsuan Ko, Chang-Hsien Yang* (2016). Characterization and Functional Analysis of TCP4 Determining the Lip Development in Erycina pusilla. The Twenty-fourth Symposium on Recent Advances in Cellular and Molecular Biology. Pingtung, Taiwan. January 27-29, 2016. Abstract No.122. 3 Yen-Ting Yu, Wen-Hsuan Ko, Pei-Wen Chung, Chang-Hsien Yang* (2016). Characterization and Functional Analysis of CONSTANS-Like Genes from Nicotiana benthamiana and Oryza sativa in Regulating Anther Development. The Twenty-fourth Symposium on Recent Advances in Cellular and Molecular Biology. Pingtung, Taiwan. January 27-29, 2016. Abstract No.15. 4 Yong-Xiang Zhan, Pei-Fang Lee, Jou-Chen Wang, Chang-Hsien Yang* (2016). Functional analysis of AtERF19 and characterization of its downstream genes in Arabidopsis. The Twenty-fourth Symposium on Recent Advances in Cellular and Molecular Biology. Pingtung, Taiwan. January 27-29, 2016. Abstract No.131. 5 Kuo-Pen Cheng, Chang-Hsien Yang* (2015). Characterization and functional analysis of FUF1 downstream gene─RAP2.9 in Arabidopsis. 2015 Symposium on Translational Plant Science. Taipei, Taiwan. November 28-29. 2015. Abstract No.55. 6 Yu-Ming Huang, Wen-Hsuan Ko, Chang-Hsien Yang* (2015). Characterization and Functional Analysis of TCP4 Determining the Lip Development in Erycina pusilla. 2015 Symposium on Translational Plant Science. Taipei, Taiwan. November 28-29. 2015. Abstract No.57. 7 Yen-Ting Yu, Wen-Hsuan Ko, Chang-Hsien Yang* (2015). Characterization and Functional Analysis of CONSTANS-Like Genes from Nicotiana benthamiana and Oryza sativa in Regulating Anther Development. 2015 Symposium on Translational Plant Science. Taipei, Taiwan. November 28-29. 2015. Abstract No.B. 8 Yong-Xiang Zhan, Chang-Hsien Yang* (2015). Functional analysis of AtERF19 and characterization of its downstream genes in Arabidopsis. 2015 Symposium on Translational Plant Science. Taipei, Taiwan. November 28-29. 2015. Abstract No.C. 9 Chang-Hsien Yang* (2015) Functional Analysis of Genes in Regulating the Flowering Time, Flower Formation and Senescence/abscission in Plants. Symposium on Agricultural and Biological Sciences, Guangxi, China, October 27-31, 2015. Invited speaker. 10 Pei-Tzu Lin, Wei-Han Chen, Chang-Hsien Yang* (2015). Functional analysis of FYL1, FYL2 and protein complexes of FYF in Arabidopsis. The Twenty-third Symposium on Recent Advances in Cellular and Molecular Biology. Pingtung, Taiwan. February 4-6, 2015. Abstract No.66. 11 Wen-Hsuan Ko, Pei-Wen Chung, and Chang-Hsien Yang* (2015). Characterization and Functional Analysis of Orchid (Cattleya intermedia) CONSTANS-Like Gene (CaCOL10) in Regulating Flowering Time and Flower Development. The Twenty-third Symposium on Recent Advances in Cellular and Molecular Biology. Pingtung, Taiwan. February 4-6, 2015. Abstract No.86. 12 Pin-Shuang Huang, Tzu-Yi Shen, Wei-Han Hsu, Chang-Hsien Yang* (2015). Functional Analysis of GIGANTEA (GI) Orthologues from Arabidopsis and Ferns Reveals the Possibly Functional Diversity for their C- and N-terminal Portion. The Twenty-third Symposium on Recent Advances in Cellular and Molecular Biology. Pingtung, Taiwan. February 4-6, 2015. Abstract No.165. 13 Ming-Jing Tsai, Je-Yi Lin, Chang-Hsien Yang* (2015). Functional Analysis of Proteins Interacting with OAF to Regulate Ovule Development. The Twenty-third Symposium on Recent Advances in Cellular and Molecular Biology. Pingtung, Taiwan. February 4-6, 2015. Abstract No.191. 14 Yi-Chun Hsieh, Kun-Hung Li, Chang-Hsien Yang* (2015). Characterization and Functional Analysis of B and C Functional MADS Box Genes in Regulating Floral Organ of Eustoma grandiflorum. The Twenty-third Symposium on Recent Advances in Cellular and Molecular Biology. Pingtung, Taiwan. February 4-6, 2015. Abstract No.212. 15 Wen-Hsuan Ko, Pei-Wen Chung, and Chang-Hsien Yang* (2014). Characterization and Functional Analysis of Orchid (Cattleya intermedia) CONSTANS-Like Gene (CaCOL10) in Regulating Flowering Time and Flower Development. 2014 Symposium on Modern Plant Science and Agricultural Technology. Taipei, Taiwan. December 13-14. 2014. 16 Yi-Chun Hsieh, Kun-Hung Li, Chang-Hsien Yang* (2014). Characterization and Functional Analysis of B and C Functional MADS Box Genes in Regulating Floral Organ Formation in Eustoma grandiflorum. 2014 Symposium on Modern Plant Science and Agricultural Technology. Taipei, Taiwan. December 13-14. 2014. 17 Pin-Shuang Huang, Tzu-Yi Shen, Wei-Han Hsu, Chang-Hsien Yang* (2014). Functional Analysis of GIGANTEA (GI) Orthologues from Arabidopsis and Ferns Reveals the Possibly Functional Diversity for their C- and N-terminal Portion. 2014 Symposium on Modern Plant Science and Agricultural Technology. Taipei, Taiwan. December 13-14. 2014. 18 Ming-Jing Tsai, Je-Yi Lin, Chang-Hsien Yang* (2014). Functional Analysis of Proteins Interacting with OAF to Regulate Ovule Development. 2014 Symposium on Modern Plant Science and Agricultural Technology. Taipei, Taiwan. December 13-14. 2014. 19 Pei-Tzu Lin, Wei-Han Chen, Chang-Hsien Yang* (2014). Functional analysis of FYL1, FYL2 and protein complexes of FYF in Arabidopsis. 2014 Symposium on Modern Plant Science and Agricultural Technology. Taipei, Taiwan. December 13-14. 2014. 20 Hsing-Fun Hsu, Yi-Hsuan Chen and Chang-Hsien Yang* (2014). Functional analysis of genes determining the lip development in Oncidium orchids. 10th International Symposium on Biocatalysis and Agricultural Biotechnology, Kaohsiung, Taiwan, October 28-31, 2014. Invited speaker. 21 Chang-Hsien Yang* (2014). Functional analysis of genes in regulating the flowering time, flower formation and senescence/abscission in plants. 15th IUBMB-24th FAOBMB-TSBMB Conference, Taipei, Taiwan, October 21-26, 2014. Invited speaker. 22 Wei-Han Chen, Pei-Fang Lee, Ming-Kun Chen and Chang-Hsien Yang* (2014). Functional analysis of genes regulated by FOREVER YOUNG FLOWER in controlling Arabidopsis floral organ senescence, abscission and development. International Symposium on Plant Sexual Reproduction, Taipei, Taiwan, October 15-17, 2014. Invited speaker. 23 Pei-Wen Chung, Wei-Han Hsu and Chang-Hsien Yang* (2014). Functional analysis of three Orchid (Oncidium Gower Ramsey) CO-like genes reveals their diverse roles in regulating growth and development in Arabidopsis. Plant Biology 2014, Portland USA, July 12-16, 2014. Abstract No. P20011-B. 24 Wei-Han Chen, Pei-Fang Lee, Ming-Kun Chen and Chang-Hsien Yang* (2014). Functional analysis of genes regulated by FOREVER YOUNG FLOWER in controlling Arabidopsis floral organ senescence and abscission. 39th Annual Conference for The Malaysian Society for Biochemistry and Molecular Biology (MSBMB), Kuala Lumpur Malaysia, June 25-26, 2014. Invited plenary speaker. 25 Yi-Hsuan Chen, Hsin-Fun Hsu and Chang-Hsien Yang* (2014). Isolation and functional analysis of candidate genes determining the lip development in Oncidium orchids. The Twenty-second Symposium on Recent Advances in Cellular and Molecular Biology. Pingtung, Taiwan. January 22-24, 2014. Abstract No.115. 26 Mao-Cheng Hsu, Cheng-Jing Hou and Chang-Hsien Yang* (2014). Molecular characterization and functional analysis of SUPPRESSOR OF CONSTANS OVEREXPRESSION 1 (SOC1) gene from Oncidium Gower Ramsey. The Twenty-second Symposium on Recent Advances in Cellular and Molecular Biology. Pingtung, Taiwan. January 22-24, 2014. Abstract No.111. 27 Pei-Fang Lee, Jou-Chen Wang, Wei-Han Chen, Ming-Kun Chen and Chang-Hsien Yang* (2014). Characterization and Functional Analysis of an ERF Gene Regulated by FYF in Controlling Flower Organ Senescence and Abscission in Arabidopsis. The Twenty-second Symposium on Recent Advances in Cellular and Molecular Biology. Pingtung, Taiwan. January 22-24, 2014. Abstract No.50. 28 Tzu-Hsiang Huang, Wei-Han Chen, Cheng-Jing Hou and Chang-Hsien Yang* (2014). Molecular characterization and functional analysis of ethylene synthesis gene OnACS12 and ethylene signal pathway gene OnETR1 from Oncidium Gower Ramsey. The Twenty-second Symposium on Recent Advances in Cellular and Molecular Biology. Pingtung, Taiwan. January 22-24, 2014. Abstract No.148. 29 Yi-Hsuan Chen, Hsin-Fun Hsu and Chang-Hsien Yang* (2013). Isolation and functional analysis of candidate genes determining the lip development in Oncidium orchids. 2013 Symposium on Modern Plant Science and Agricultural Technology, Taipei, Taiwan, December 14-15, 2013. Abstract No.70. 31 Chen Wang, Pei-Fang Lee, Wei-Han Chen and Chang-Hsien Yang* (2013). Characterization and Functional Analysis of an ERF Gene Regulated by FYF in Controlling Flower Organ Senescence and Abscission in Arabidopsis. 2013 Symposium on Modern Plant Science and Agricultural Technology, Taipei, Taiwan, December 14-15, 2013. Abstract No.58. 32 Tzu-Hsiang Huang, Wei-Han Chen, Cheng-Jing Hou and Chang-Hsien Yang* (2013). Molecular characterization and functional analysis of ethylene synthesis gene OnACS12 and ethylene signal pathway gene OnETR1<>/i from Oncidium Gower Ramsey. 2013 Symposium on Modern Plant Science and Agricultural Technology, Taipei, Taiwan, December 14-15, 2013. Abstract No.57. 33 Wei-Han Chen, Pei-Fang Lee, Ming-Kun Chen and Chang-Hsien Yang* (2013). Functional Analysis of Genes Regulated by FOREVER YOUNG FLOWER in Controlling Arabidopsis Floral Organ Senescence and Abscission. 2013 Symposium on Modern Plant Science and Agricultural Technology, Taipei, Taiwan, December 14-15, 2013. Invited speaker. 34 Wei-Han Chen, Pei-Fang Lee, Ming-Kun Chen and Chang-Hsien Yang* (2013). FOREVER YOUNG FLOWER Regulates EDF s and ERFs to Control Arabidopsis Floral Organ Senescence and Abscission. Winter Camp for The Taiwan Society for Biochemistry and Molecular Biology, Taichung, Taiwan, September 22-24, 2013. Invited speaker. 35 Wei-Han Chen, Pei-Fang Lee, Ming-Kun Chen and Chang-Hsien Yang* (2013). The EDF Genes and a Newly Characterized ERF, FAF1, Coordinate to Regulate Floral Organ Senescence and Abscission via a FYF-dependent pathway. WORKSHOP FRANCO TAIWANAIS, Font-Romeu, France, October 23-24, 2013. Invited speaker. 36 Hong-Ie Chen and Chang-Hsien Yang* (2013). The NAC-like gene GIBBERELLIN SUPPRESSING FACTOR Controls Plant Growth and Development by Regulating Gibberellin Metabolism Pathway in Arabidopsis. ICAR 2013, The 24th International Conference on Arabidopsis Research, Sydney, Australia, June 24-28, 2013. Abstract No.109. 37 Wei-Han Hsu, Tsung-Jen Yeh, Kai-Yu Huang, Jen-Ying Li, Hsing-Yu Chen and Chang-Hsien Yang* (2013). AGAMOUS-LIKE13, a putative ancestor for the E functional genes, specifies male and female gametophyte morphogenesis. Flower Development Workshop, Presqu'île de Giens, France, June 8-12, 2013. 39 Tien-Hsin Chuang, Kun-Hung Li and Chang-Hsien Yang* (2013). Characterization and functional analysis of A functional MADS box genes in regulating floral organ formation in Eustoma gradiflorum. The Twenty-First Symposium on Recent Advances in Cellular and Molecular Biology. Pingtung, Taiwan. January 30-February 23, 2013. Abstract No.129. 40 Meng-Shan Li, Wei-Han Chen and Chang-Hsien Yang* (2013). Molecular Characterization of INDOLE-3-ACETIC ACID INDUCIBLE 33 (IAA33) gene in Arabidopsis thaliana. The Twenty-First Symposium on Recent Advances in Cellular and Molecular Biology. Pingtung, Taiwan. January 30-February 23, 2013. Abstract No.051. 41 Che-Jui Hsu, Pei-Wen Chung and Chang-Hsien Yang* (2013). Functional analysis of two CONSTANS-LIKE (COL) genes reveals their reversed role in regulating flowering and floral development in Arabidopsis thaliana. The Twenty-First Symposium on Recent Advances in Cellular and Molecular Biology. Pingtung, Taiwan. January 30-February 23, 2013. Abstract No.133. 42 Tzu-Yi Shen, Yu-Yun Chang and Chang-Hsien Yang* (2013). Characterization and functional analysis of GIGANTEA (GI) orthologues from Arabidopsis and Ferns reveals the possibly functional diversity for their C- and N-terminal portion. The Twenty-First Symposium on Recent Advances in Cellular and Molecular Biology. Pingtung, Taiwan. January 30-February 23, 2013. Abstract No.059. 43 Hong-Ie Chen and Chang-Hsien Yang* (2013). The NAC-like gene AtNACL14 controls plant growth and development by regulating gibberellins metabolism pathway in Arabidopsis. The Twenty-First Symposium on Recent Advances in Cellular and Molecular Biology. Pingtung, Taiwan. January 30-February 23, 2013. Abstract No.146. 44 Kun-Hung Li and Chang-Hsien Yang* (2013). Two Eustoma grandiflorum MADS genes, EgSVP1 and EgSVP2, control flowering transition and floral senescence and abscission in Arabidopsis thaliana. The Twenty-First Symposium on Recent Advances in Cellular and Molecular Biology. Pingtung, Taiwan. January 30-February 23, 2013. Abstract No.049. 45 Jen-Ying Li, Wei-Han Hsu and Chang-Hsien Yang* (2013). Interaction of B function MADS box proteins from Lily (Lilium longiflorum). The Twenty-First Symposium on Recent Advances in Cellular and Molecular Biology. Pingtung, Taiwan. January 30-February 23, 2013. Abstract No.055. 46 Wan-Ting Mao, Yu-Yun Chang and Chang-Hsien Yang* (2012). Functional analysis of a PISTILLATA (PI) homologue of Oncidium Gower Ramsey. 2012 Symposium on Innovative Plant Sciences. Taipei, Taiwan. December 22-23, 2012. Abstract # P33. 47 Tien-Hsin Chuang, Kun-Hung Li and Chang-Hsien Yang* (2012). Characterization and functional analysis of A functional MADS box genes in regulating floral organ formation in Eustoma gradiflorum. 2012 Symposium on Innovative Plant Sciences. Taipei, Taiwan. December 22-23, 2012. Abstract # P51. 48 Meng-Shan Li, Wei-Han Chen and Chang-Hsien Yang* (2012). Molecular Characterization of INDOLE-3-ACETIC ACID INDUCIBLE 33 (IAA33) gene in Arabidopsis thaliana. 2012 Symposium on Innovative Plant Sciences. Taipei, Taiwan. December 22-23, 2012. Abstract # P39. 49 Che-Jui Hsu, Pei-Wen Chung and Chang-Hsien Yang* (2012). Functional analysis of two CONSTANS-LIKE (COL) genes reveals their reversed role in regulating flowering and floral development in Arabidopsis thaliana. 2012 Symposium on Innovative Plant Sciences. Taipei, Taiwan. December 22-23, 2012. Abstract # P52. 50 Tzu-Yi Shen, Yu-Yun Chang and Chang-Hsien Yang* (2012). Characterization and functional analysis of GIGANTEA (GI) orthologues from Arabidopsis and Ferns reveals the possibly functional diversity for their C- and N-terminal portion. 2012 Symposium on Innovative Plant Sciences. Taipei, Taiwan. December 22-23, 2012. Abstract # P42. 51 Hong-Ie Chen and Chang-Hsien Yang* (2012). The NAC-like gene AtNACL14 controls plant growth and development by regulating gibberellins metabolism pathway in Arabidopsis. 2012 Symposium on Innovative Plant Sciences. Taipei, Taiwan. December 22-23, 2012. Abstract # P22. 52 Kun-Hung Li and Chang-Hsien Yang* (2012). Two Eustoma grandiflorum MADS genes, EgSVP1 and EgSVP2, control flowering transition and floral senescence and abscission in Arabidopsis thaliana. 2012 Symposium on Innovative Plant Sciences. Taipei, Taiwan. December 22-23, 2012. Abstract # P10. 53 Jen-Ying Li, Wei-Han Hsu and Chang-Hsien Yang* (2012). Interaction of B function MADS box proteins from Lily (Lilium longiflorum). 2012 Symposium on Innovative Plant Sciences. Taipei, Taiwan. December 22-23, 2012. Abstract # P11. 54 Chiu Sien Ng and Chang-Hsien Yang* (2012). The NAC-like gene AUXIN SUPPRESSING FACTOR Regulates Root, Leaf Development and Anther Dehiscence by Affecting the Auxin Homeostasis in Arabidopsis. Auxin 2012. Hawaii, USA, December 9-14, 2012. Invited speaker. 55 Wei-Han Chen, Tung-Lin Hsieh, Ming-Kun Chen and Chang-Hsien Yang* (2012). Two Orchid (Oncidium Gower Ramsey) SVP Genes, Act as Repressor Controlling Flowering Transition and Floral Organ Senescence and Abscission in Arabidopsis.10th International Congress on Plant Molecular Biology. Jeju, Korea. Octorber 21-26, 2012. Abstract # GR-070. 56 Pei-Wen Chung, Yu-Yun Chang and Chang-Hsien Yang* (2012). Functional Analysis of Three Orchid (Oncidium Gower Ramsey) CO-like Genes Reveals Their Diverse Roles in Regulating Growth and Development in Arabidopsis.10th International Congress on Plant Molecular Biology. Jeju, Korea. Octorber 21-26, 2012. Abstract # DB-090. 57 Pei-Wen Chung,Yu-Yun Chang and Chang-Hsien Yang* (2012). Characterization and Functional Analysis of CONSTANS-like genes in regulating plant development and flowering in Oncidium Gower Ramsey. 20th Symposium on Recent Advances in Cellular and Molecular Biology. Kaoshiung, Taiwan. February 7-9, 2012. Abstract # 262. 58 Kai-Yu Huang, Wei-Han Hsu and Chang-Hsien Yang*(2012). Characterization and functional analysis of LEA40 gene in controlling anther dehiscence in Arabidopsis thaliana. 20th Symposium on Recent Advances in Cellular and Molecular Biology. Kaoshiung, Taiwan. February 7-9, 2012. Abstract # 187. 59 Wei-Han Chen, Ming-Kun Chen and Chang-Hsien Yang* (2012). Molecular cloning and characterization of ethylene response DNA binding factors in Arabidopsis thaliana. 20th Symposium on Recent Advances in Cellular and Molecular Biology. Kaoshiung, Taiwan. February 7-9, 2012. Abstract # 155. 60 Chun-Chung Chen, Ching-Fang Shih and Chang-Hsien Yang* (2012). Molecular cloning and characterization of CONSTANS-LIKE genes in regulating plant development from Arabidopsis thaliana. 20th Symposium on Recent Advances in Cellular and Molecular Biology. Kaoshiung, Taiwan. February 7-9, 2012. Abstract # 140. 61 Wei-Han Hsu, Tsai-Yu Tzeng and Chang-Hsien Yang* (2012). The Arabidopsis YPEL gene, GUARD FOR CELL DIVISION, acts as a repressor preventing cell division and growth in both plant and animal. 20th Symposium on Recent Advances in Cellular and Molecular Biology. Kaoshiung, Taiwan. February 7-9, 2012. Abstract # 126. 62 Pei-Wen Chung, Yu-Yun Chang and Chang-Hsien Yang* (2011). Characterization and Functional Analysis of CONSTANS-like genes in regulating plant development and flowering in Oncidium Gower Ramsey. 2011 Annual Meeting of The Chinese Botany Society. NanTou, Taiwan. November 13-14, 2011. Abstract # B56. 63 Kai-Yu Huang, Wei-Han Hsu and Chang-Hsien Yang* (2011). Characterization and functional analysis of LEA40 gene in controlling anther dehiscence in Arabidopsis thaliana. 2011 Annual Meeting of The Chinese Botany Society. NanTou, Taiwan. November 13-14, 2011. Abstract # B43. 64 Wei-Han Chen and Chang-Hsien Yang* (2011). Molecular cloning and characterization of ethylene response DNA binding factors in Arabidopsis thaliana. 2011 Annual Meeting of The Chinese Botany Society. NanTou, Taiwan. November 13-14, 2011. Abstract # B35. 65 Chun-Chung Chen, Ching-Fang Shih and Chang-Hsien Yang* (2011). Molecular cloning and characterization of CONSTANS-LIKE genes in regulating plant development from Arabidopsis thaliana. 2011 Annual Meeting of The Chinese Botany Society. NanTou, Taiwan. November 13-14, 2011. Abstract # B34. 66 Chang-Hsien Yang* (2011). Functional analysis of genes controlling flower transition, formation and senescence in orchid (Oncidium ‘Gower Ramsey). 2011 International Symposium on Orchid Molecular Markers and Genomics, Tainan, Taiwan, November 10, 2011. Invited speaker. 67 Ming-Kun Chen, Tung-Lin Hsieh, Pei-Fang Lee and and Chang-Hsien Yang* (2011). Functional analysis of genes in regulating flower senescence, abscission and flowering time in Oncidium ‘Gower Ramsey’. 7th International Society of Biocatalysis and Agricultural Biotechnology (ISBAB) annual meeting, Kyoto, Japan, October 10-13, 2011. Invited speaker. 68 Yu-Yun Chang, Yen-Wei Chu, Hsing-Fun Hsu, Chi-Wei Chen, Wei-Ming Leu and Chang-Hsien Yang* (2011). Characterization of Oncidium ‘Gower Ramsey’ transcriptomes using 454 GS-FLX pyrosequencing and their application to the identification of genes associated with flowering time. 2011 Canadian Plant Genomics Workshop, Niagara Falls, Ontario. Canada, August 22-25, 2011. Abstract #54. 69 Ching-Fang Shih and and Chang-Hsien Yang* (2011). Characterization of a NAC-like gene that regulates stamen development in Arabidopsis thaliana. The International Conference Plant Gene Discovery Technologies. Venue. February 23- 26. 2011. 70 Yu-Yun Chang, Yen-Wei Chu, Wei-Ming Leu and Chang-Hsien Yang* (2011). Characterization of Oncidium ‘Gower Ramsey’ transcriptome for using GS-FLX 454 pyrosequencing and its application for studies of flowering time associate genes. The International Conference Plant Gene Discovery Technologies. Venue. February 23- 26. 2011. 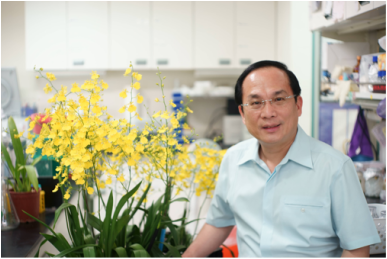 71 Chang-Hsien Yang* (2010) Characterization of genes regulating flowering time, flower formation and senescence in Oncidium orchid. The Czeck-Taiwan and Slovak-Taiwan Bilateral Workshop. Prague, September 1-5, Bratislava, September 5-8, 2010. Invited speaker. 72 Ming-Kun Chen, Muthu Thiruvengadam, Pei-Fang Lee, Wei-Han Hsu, Hong-Ie Chen and Chang-Hsien Yang* (2010) The MADS Box Gene FOREVER YOUNG FLOWER Controls Floral Organ Senescence and Abscission Primarily by Regulating Ethylene Signaling and IDAArabidopsis. 2010 Annual Meeting of The American Society of Plant Biologists. Montréal, Canada, July 31-August 4, 2010. Abstract # 04007. 1 Chang, Y-Y, Hsu, H-F, Yang C-H* (2011) Chapter 11. Flower Development in the Oncidium Orchid. In: Orchid Biotechnology II. Eds: Chen, W.H., and Chen, H.H. World Scientific Publishing Co. Pte. Ltd., Singapore. 台中市南區興大路145號生物科技學研究所 No. 145 Xing-Da Rd., Taichung, 402 Taiwan, R.O.C.